An example is that when Muslims seek refuge, they often run to a physical place. Rather than kneeling in prayer in the environment in which one lives and transforming that into a place of worship and remembrance, people tend to seek out the domain of a building, corner of the house or even a book designed specifically for such a purpose. For this reason the science of sacred geometry emerged. Sacred geometry is the science of creating a space, writing or other artwork, which reminds one of the greatness of Allah. Under al-Biruni, geometry was called geodesy and was classified as natural philosophy involving matter and form combined with time and space. During the time of Ibn Sina, it was classified as mathematical sciences. Today, not surprisingly, geometry resides purely in the physical domain (Nasr, p.215). However, many people still consider geometry a religious science. 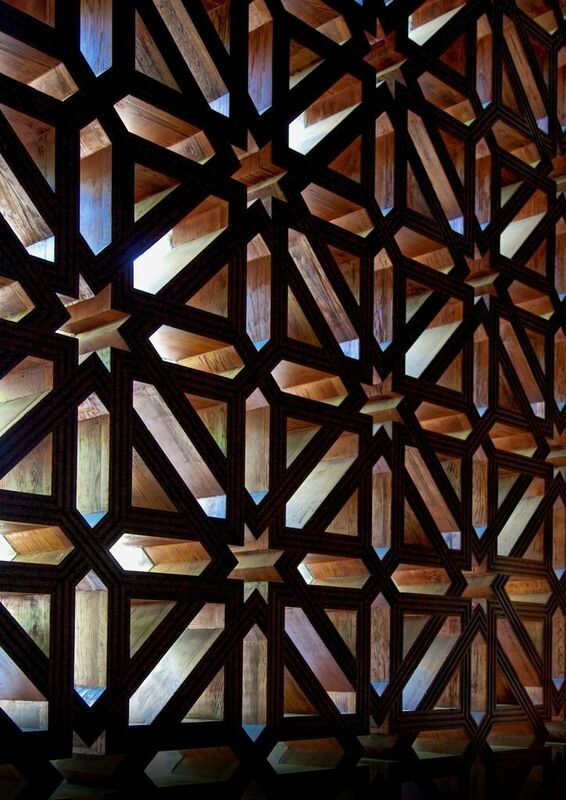 In fact, Islamic religious architectural design is based on sacred geometry. 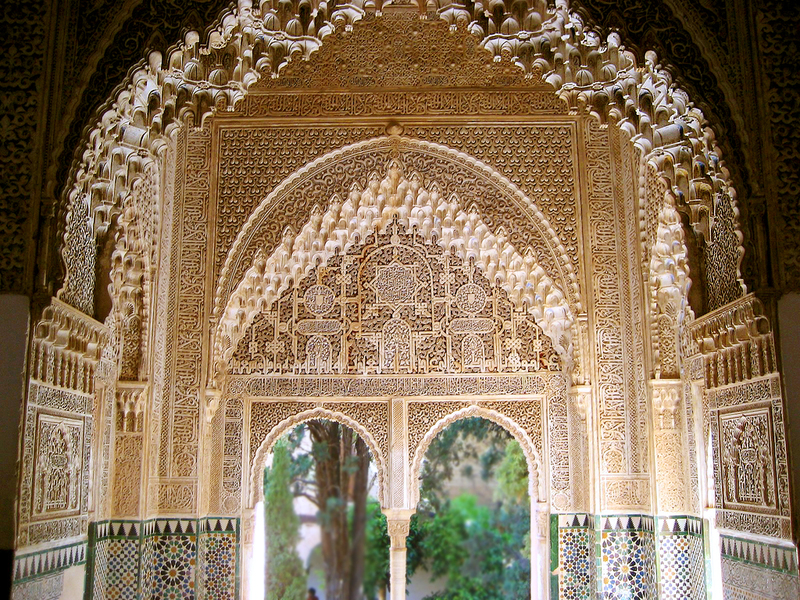 Many spiritual and miraculous concepts are represented in the geometrical patterns of Islamic buildings. Geometry can even affect the mechanical function of a place of worship. Mechanically, the domes of Islamic madressas and mosques are power enhancers. A whisper on one side of a sound-reflected domed-building is easily heard because the sound is focused towards the center of the spherical shape. This principle applies to all forms of energy under a dome: a concave lens, dish antennae’s and electromagnetic waves (integraton, p.1). Referring to domes in Islamic architecture traveler Brian Wingate pondered “The designs are so intricate and geometric that they seem to turn in endlessly upon themselves, inviting your own mind to do the same” (Wingate, p.1). Furthermore, Muslim builders who adopted the dome from previous traditions in their buildings introduced other concepts to Islamic architecture as well. Pythagoras who learned Geometry in Egypt is credited for discovering that an oscillating string stopped halfway along its length produces an octave relative to the string’s fundamental, while a ratio of 2:3 produces a perfect fifth and 3:4 produces a perfect fourth. Chinese also featured the same mathematical positions on the Guqin and the tone holes in flutes. Pythagoreans believed these harmonic ratios gave music powers of healing which could “harmonize” an out-of-balance body. Their intention has been to make the non-physical, physical, through craftsmanship and artistry using local materials. It is this transcendence that the Dome of the Rock –el Qubbet ul Sakhrah speaks of. In ancient Semitic tradition, this site was the intersection of the underworld and upper-world. This was where Prophet Abraham built an alter to sacrifice his son Ishmael and was where God, through Prophet Nathan, rejected David’s wish to build a temple because he had shed blood (Bible- Samuel II, 7:12,13). This same site was also where the Hellenic and Greek god Apollo was worshipped in the belief that this was the intersection of both worlds (sacredsites, p.1). Traditionally, the compound of the Dome of the Rock is a place of pilgrimage and is the direction of our first qibla. Ultimately, however, the goal of sacred geometry is to create a space, which is in physical harmony. This attempt at environmental harmony is intended to be a reflection of the divine concept of the harmony of humanity (Fathy, p.1, 2). Furthermore, it is thought that when humans live in an environment that visually declares harmony they are also more likely to be in harmony. “An illuminated heart is capable of seeing the stamp which helps in transcending this realm to the other!” said Sa’id al-Nursi (abu-Sway, p.10). The science of sacred geometry lies in the perfection of its reflection of the physical world and its representation of how strongly humanity is governed by geometry. Water molecules, carbon atoms, proteins, viruses, cells, and tissues are able to facilitate their purpose in the cycle of life because of their geometrical design. Flower of Life, Golden Ratio, Algorithmic Art and many other similar philosophical/scientific concepts allowed Numerology to identify the following definitions for Geometry: Number 1 means: Singularity & Leadership. Number 2 means: Balance & Unity. Number 3 means: Communication. Number 4 means: Creation. Number 5 means: Restlessness. Number 6 means: Responsibility & Art of Nature. Number 7 means: Thought. Number 8 means: Power. Number 9 means: Highest level of changes. Number 10 means: Satan who opposes the Leadership of Cosmos. These organisms ability to stabilize mechanically is due to their connectedness to a frame of triangles, pentagons and hexagons. In the past, humans have attempted to break the geometry of the physical world, but it has always resulted in destruction, rather than re-creation. Rahul Singhvi and others have tried to force living cells to take on other geometrical shapes because they believed that by changing the shape of cells, they could switch God’s genetic programming. Instead the cells became flat away from their geodesic dome shapes and developed a propensity to divide and activated apoptosis – a death program. George Gurdjieff, a priest who traveled much in the Islamic world, said, “Among works of art, especially works of ancient art, you meet with many things you cannot explain and which contain a certain something you do not feel in modern works of art”. “Objective art requires at least flashes of objective consciousness; in order to understand these flashes properly and to make proper use of them a great inner unity is necessary and a great control of oneself” (Ouspensky, p. 26, 298). ‘Abu-Sway, Mustafa. “Towards an Islamic Jurisprudence of the Environment.”Articles. 1998. Fathy, Hassan. “Architecture and Environment.” Arid Land Newsletter. 36(1994). Hayat-Ma’n, Yitzhak. “Investigation of the Dome of the Rock.” Academy of Jerusalem. 05/18/02. Ingber, Donald, E. “The Architecture of Life.” Scientific America. 04/27/01. Lapidus, Ira. M. “A History of Islamic Societies.” Britain: Cambridge University Press. 1995. Mould, Moustafa. “Odyssey to Islam.” Jewish Converts News. 09/30/01. Nasr, Seyyed Hossein. ‘Islamic Cosmological Doctrines.” Britain: Thames and Hudson. 1978. Ouspensky, P.D. “In Search of the Miraculous.” Britain: Routledge & Kegan Paul. 1983. Sacredsites.com. “Dome of the Rock.” Sacred Sites News. 05/19/02. Sakkal, Mamoun. “(Computational) Geometry in Islam Architecture.”Kalam.org. 05/30/02. Templemountfaithful.org. “The Riddle of the Dome of the Rock.” Temple of the Mount. 05/19/02. Woolf, Marie. “ North London Synagogue Desecrated with Swastikas.”Independent.co.uk. 05/04/02. This article was first published in 2009 and is currently republished for its uniqueness.